Last time we took a detour here on Baking and Mistaking, it was for soup. This detour isn't quite as delicious. If you're a regular here, you may notice I've been gone for a couple weeks. The first week, I was busy, and stressed, and midterms and papers galore. This week was spring break. I had thought I would relax, get some things done I'd been putting off and do some baking. Over the weekend I was in my parents house. It was raining almost all Saturday, and there were pretty heavy winds. In the late afternoon, the storm intensified, and you could hear the winds whistling through trees and houses. There were branches littering the streets and lawns, and it poured and poured. Then, around 5:30 p.m., we heard an enormous crash and sounds of things flying against our windows. Within a minute we realized that a tree about 20 feet from our house had fallen on to our den. It took another few minutes for the details to sink in: the roots had ripped an enormous hole in the lawn, pieces of the chimney were broken, the limbs of the tree reached to the other side of our house. 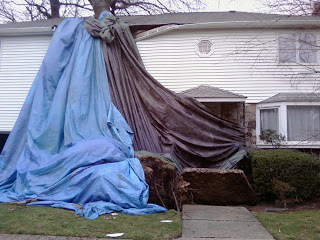 We were a little shocked, but unhurt, and the tree didn't seem to do any major damage. However we did lose power, and were congregated in the dark contemplating the rest of the evening. We were calling the electric company, our insurance company, and the fire department. We couldn't get through anywhere, since there were hundreds of trees down in the area, thousands of people without electricity and the storm continued to rage. Around 8 that night, as the downpour continued, we were dispersed in different parts of the house. Suddenly, an enormous crash came from upstairs. It sounded like things were hitting the roof, crashing in. The noise continued for what felt like a minute. When the noise stopped we all ran towards the stairs, rushing up to the second floor. When I pulled open the door to my bedroom, I burst in to tears. It looked like a hurricane hit. The events of the next hour were murky, but we ended up leaving the house, dispersing to various friends, none of whom had any power themselves. But they didn't have trees in them either. The next day we came back to survey the damage. 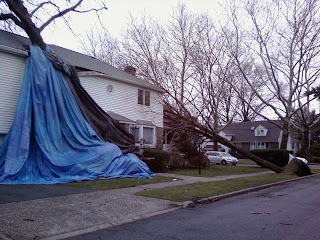 The roots of the second tree had also pulled up a large section of our front walkway to an almost 90 degree angle. And that second tree had also broken through the wall and window in my bedroom, as well as tore a hole in the roof, and broken the gutter. 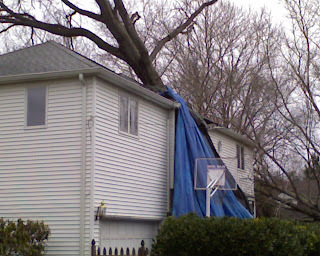 In fact the branches had even done damage to the gutter on the other side of the house. That's 100 feet of oak right there. Though the dining room and basement had significant water damage, the destruction from the tree was 90% confined to my room. And it wasn't pretty. These pictures were taken on Monday, when many of my belongings had already been dragged out in an attempt to save them. 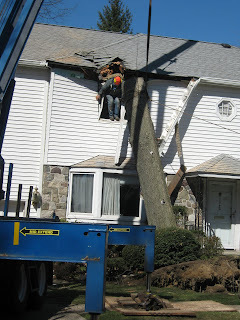 Since then, we've been mostly watching the tree removal process. Which, were it not so personal, would be mighty entertaining. Ok, it might still be entertaining. We begin with the biggest crane I've ever seen. And then we dangle a man from it. Can you find him? Then that man removes tree pieces bit by bit, until all that remains is the trunk. The man takes a break, and has a cigarette, in the tree. At this point we break for the night, which of course involves our friendly tree man rappelling down the side of the house with a chainsaw dangling next to his leg. And cut some more away. Then of course you can change your shoes on the roof. 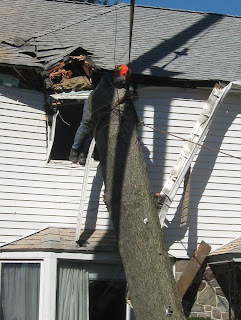 And cut the tree in half while dangling out of a broken window. All in a days work. Brass balls man. Unfortunately, at this point I had to go to work, but you can imagine how this continued. Now, I get to redecorate when I had no plans to redecorate, and finish out my final semester of college, and move in to the real world. Hopefully I'll get back to baking soon. And my next detour will be a little more kitchen-related. I'm not going to dwell on this in the coming weeks, although I will point out that I did miss Pi(e) Day. And I was hoping to have some Passover recipes this year but I'm not sure how that will work out. Hey, maybe you'll even see an "after" picture of my room. Consider the above the "before." poem of the day? wow, this blog is ch-ch-changing. Oh you poor thing! I am so sorry! We had a house fire years ago, and although it mostly caused smoke damage, except where the fire was (the living room) I can still sorta relate to the feels you are having. Loss, feeling overwhelmed, confused, but yet feeling happy that it wasn't worse and that no one got hurt! I'll be praying for ya hun! poor thing Amy - really feel for you and only hope you managed to rescue those coveted 'year books!" This is what you get when you combine journalism, English lit and baking ......a great post - haven't seen that Robert Frost one before. Amy take care, keep well and we'll manage with our old Pesach recipes for another year. OH sorry to hear about this. It's good no one got hurt. this is terrible.